A number of functional ingredients are added to meat to act as preservatives, flavorings, coloring, etc. These are generally dissolved into water to form a “brine” which is then injected into the meat. Another purpose of the brine is to increase the volume and weight (or yield) of the product. The increase in yield varies widely according to type, price and quality of the finished product, typically from below 15 to more than 50%. The mixer must be capable of completely dissolving solids such as sugar and salt to ensure they do not block the injection system and to attain their functionality. Similarly, stabilizers must be properly dispersed and completely hydrated to produce an agglomerate-free solution. The brine must be stable to prevent separation or sedimentation. Rectangular vessels (e.g. tote bins) are often used. 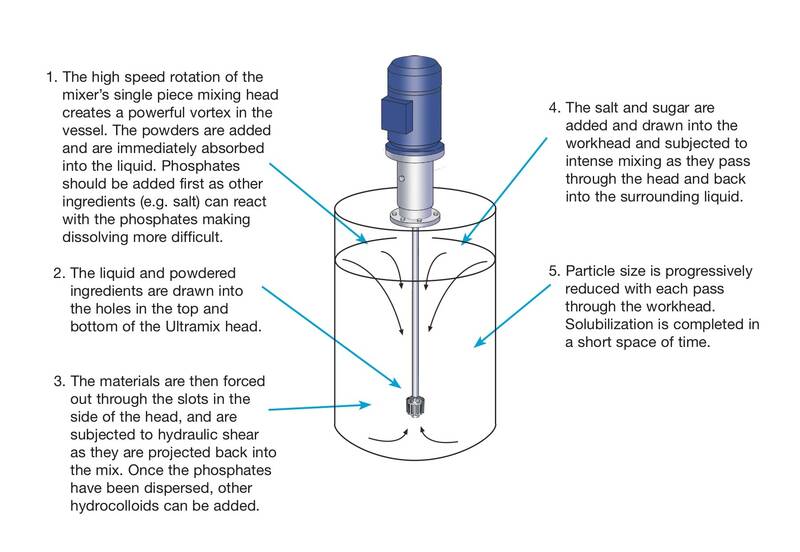 Maintaining vigorous in-tank movement is essential to ensure solids do not remain undissolved or precipitate in these less than ideal mixing vessels. Temperatures must be kept low throughout the process. In some cases ice is added to the solution to maintain the required temperature. The mixing equipment must be resistant to abrasion/corrosion. Formulations with higher concentrations of salt have a high S.G. This requires the input of considerable energy to fully solubilize the salt, particularly at ambient or reduced temperatures. Phosphates are very difficult to dissolve. Incomplete solubilization can cause water to separate from the meat after processing. Stabilizers tend to form agglomerates which cannot be broken down by agitation. Long mixing times are required to fully hydrate and dissolve the solids. This can cause an undesired temperature rise. When ice is added to cool the product, it can take a long time to liquefy under agitation, reducing its cooling effect. An agglomerate-free mix can be produced in a fraction of the time taken by conventional mixers. Rapid mixing time minimizes temperature rise. Rapid powder absorption rate minimizes operator error. Yield of stabilizers is maximized, reducing costs. Stable brine solution will not separate out from the finished product after injection. Ultramix machines and Batch mixers can be used on mobile floor stands allowing them to be moved from vessel to vessel. Vigorous in-tank movement overcomes the difficulties associated with rectangular vessels. The Ultramix features a single-piece mixing head with no wearing parts or bushes. All the mixer's product contact parts are in 316 stainless steel; cast iron or stainless steel motors should be specified.